GMR Energy, the flagship power venture of the GMR group has started constructing a coal-fired power plant in Raikheda village near Raipur without obtaining environmental clearance. The public hearing for the proposed 1,200 MW thermal plant was held in January last year. The clearance is still under process. When an officer of the Chhattisgarh Environment Conserva - tion Board (CECB) visited the plant on June 15, he witnessed digging in progress at the 526-hectare (ha) site and issued a notice to the company. The action was taken on the complaint of Vidhan Mishra, former state industry minister. In its response to the notice, GMR confirmed construction work was on. It said it was also diverting a road and canal passing through the site. Regional officer of CECB, A Behre assured, “Whatever little work had commenced has been stopped.” When the Down To Earth correspondent visited the site, work was on. 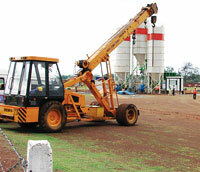 Heavy machinery like cement mixers and cranes could be seen within the fenced area. Landlevelling work was almost complete. Workers at the site said the company has sunk six tubewells to extract groundwater. All these works are illegal as the Environmental Impact Assessment (EIA) Notification of 2006 states no construction activity, including levelling of land, can commence without obtaining an environmental clearance (see ‘Jindal pays for flouting law’,). Mishra said the power plant will not only affect Raikheda, but also other villages nearby—Gaitara, Chicholi, Bhatapara and Murra. Mishra’s main concern is water. “There is hardly any water to drink in the summers. How will people survive if the company guzzles all available water?” he asked. GMR has pegged its water requirement at 36 million cubic metres in the EIA report. Water will be drawn from the Mahanadi, 35 km away. Sinking of tubewells indicate otherwise. GMR Energy’s spokesperson, Anil Kumar Jain said only a boundary and some security offices have been built. “The tubewells are for the security offices. No other construction is happening at the site,” he said. Residents are disgruntled. “Our lands have been purchased at differential rates causing conflicts among residents,” said Khilawan Sharma, former sarpanch of Raikheda. Tribals allegedly received less payment. “We have been duped. We were promised jobs but nothing has happened,” said Sharma.